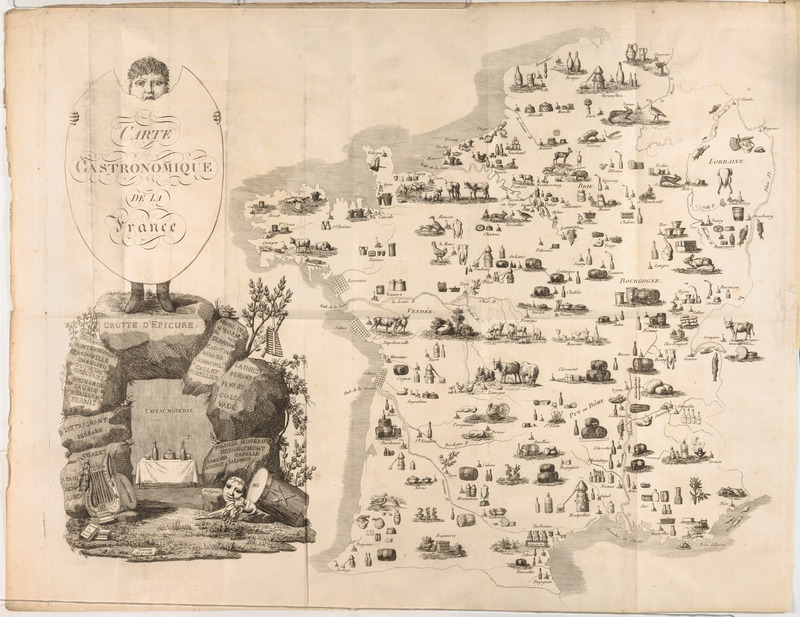 This striking map is found at the outset of the "Cours Gastronomique" by Charles Louis Cadet de Gassicourt. It is "the first example" of a carte gastronomique, "a map that summarizes a country not by its cities, mountains, or rivers but by its products." Ferguson 2004, 46. Although this map locates the regional sources of production (reflecting chapter xxviii of the book), it is less a geography lesson than a testament to the depth and variety of French food and wine. Cadet de Gassicourt was an illegitimate son of Louis XV who became a lawyer, chemist, apothecary and prolific author. Consistent with his scientific background, his "Cours Gastronomique" was aimed at "making scientific knowledge an obligatory part of gastronomic expertise." Using "current medical and chemical accounts of the operations of taste, . . . the "Cours Gastronomique" asserted a scientific foundation for gastronomic theorising." Spary 1999, 178-79. The strange cartouche on the Carte Gastronomique - featuring a young boy eating a biscuit or flatbread - is somewhat clarified by a closer look at the author. Notwithstanding this well-regarded book, Cadet de Gassicourt was apparently more gourmand than gourmet. He was a prominent member of the Caveau Moderne, a group of men that met on the 20th of every month at the Rocher de Cancale on rue Montogueil for festive singing, food and wine; it was a successor to similar groups dating to 1729. http://fr.wikipedia.org/wiki/Societe_du_Caveau, accessed November 26, 2014. The Cours Gastronomique is dedicated to "la Societe Epicurienne du Caveau moderne," and the name of the society appears on the cartouche of the Carte Gastronomique, along with the names of many known members of the society (past and contemporary) and musical instruments. At the foot of the lyre is a copy of the society's journal, "L'Épicurien Français, Ou, les Diners du Caveau Moderne." One of the songs written by Cadet Gassicourt says, "Laugh, eat, sleep and drink, rhyme and sing about nothing, love always, this is the glory of the true Epicurean. . . . We need to have fun and happiness is in pleasure. http://crht.paris-sorbonne.fr/cadet-gassicourt_souper-moliere/front-2, accessed November 26, 2014 (transl.). The collection includes many versions of “Gastronomique" maps, spanning a period of more than 150 years from 1809 into the 1960s. To view others, search “Gastronomique”. Cours Gastronomique ou Les Diners de manant-Ville, ouvrage Anecdotique, Philosophique et Litteraire, 2nd ed., Paris, 1809. In fact, this was the first edition of the Cours Gastronomique; as explained in the Avertissement des Editeurs, it was identified as such only because several chapters had previously been published in a periodical, l'Epicurien Francais.